The changes in your parenting style as you have more kids. 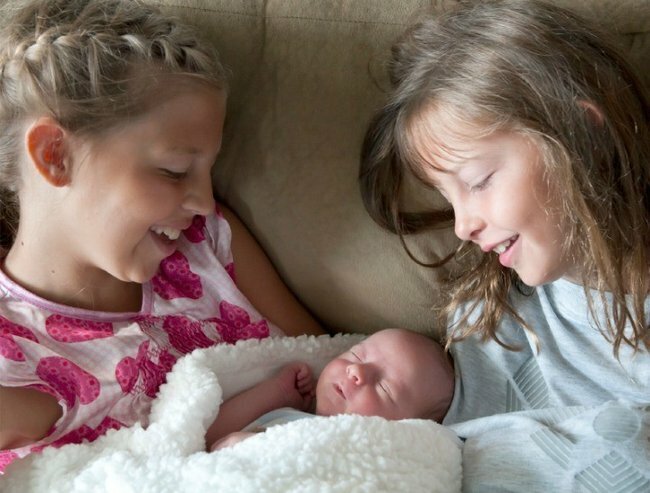 10 things you do differently from your first born baby to your third. Do you remember the birth of your first child? Of course you do. Every tiny detail. From the moment you felt your first contraction to the first time you laid eyes on your precious baby. What about the birth of your second or third? Do you remember that in quite as much detail? Or do you, like me, remember more about worrying where your eldest was and how he was coping than how long you had between contractions? Do you, like me, remember being more concerned about whether you had washed his favourite Thomas the Tank Engine top to wear while you were in hospital, rather than focusing on whether you’d bought enough baby clothes for the newborn? Did you, like me at times, even forget you were pregnant as you were just so caught up in the day-to-day toddler chaos? It’s not that you aren’t as excited about the second, or third, (or, gulp, fourth baby.) It’s just that you have a lot more on your mind. Right? What about the birth of your second or third? Do you remember that in quite as much detail? Image via iStock. There is a lot that changes for you as a parent between baby number one and baby number two or three. 1. You accept more help the second and third time round. With that first born, you just wanted to do it all yourself. It was new, it was exciting and it was your little family. You didn’t need outside help. (Especially if it came in the form of a mother-in-law, let&apos;s be honest). You were going to get this baby thing right on your own terms. Come baby number two you will happily accept whatever offers are going. By the time baby number three rolls around, you’d be comfortable handing him over to the postman for a while if he had car seats in the back of that van. Come on she loves Postman Pat. 2. You take more shortcuts. Pre-packaged purees are entirely the domain of the second or third born baby. No precious newborn is getting something squeezed in a factory. She&apos;s already tried Vegemite by the time she is 12-weeks-old. Image via iStock. By the time the rest of the clan make an appearance, those sweet little baby puree trays you bought and lovingly used to freeze cubes of mushy sweet potato have been long relegated to the Play Dough box. 3. You have less “me time”. This one seems like a no brainer. Of course you will have less “me” time with more bodies to nurture, but the irony is quite often with just one child you don’t really want “me” time (when you could probably get it). But when the house is full you are desperate to even just walk around the supermarket alone – a luxury that never happens. 4. You negotiate less over distribution of chores. Remember those hours spent agonising over who should have Saturday as a “sleep-in” and who should have the Sundays? The angst you put into who did the last nappy change? The distress over laundry? "Couldn’t anyone else who lives in this house have thought about putting them IN the machine?" you would ask yourself. One day you just ain&apos;t gonna care as much. The day will come when you’ve changed so many nappies you do it on rote, the day will come when you if you don&apos;t do washing you&apos;ll drown and sleep-ins? Sorry but the day will come when no one gets a sleep in. Ever. 5. You organise more but prepare less. With three kids you are super organised in a planning-kinda-way, but following through... maybe not so good. It’s easier to let them try it for themselves when you know from experience its achievable. Image via iStock. My household is a run three weeks in advance. Meals, activities, outfits. Like clockwork. But as for preparing those meals in advance or washing those clothes. Who has the time? 6. You fuss over them less, but cuddle them more. Second and third babies are more resilient, they have to be. Bottles are sterilised less, grapes are cut less, sheets are ironed never. But what you’ve learnt by now is how fast time goes and so there is always time for cuddles. 7. You will ask less and work on instinct more. After all there are only so many rashes you can post on Facebook aren’t there? 8. You will compromise more. Those hideous plastic brightly coloured toys you swore you would never have? Baby number three - hello Fisher Price! Those nap times you stuck to with military precision? Sorry got a school run to complete. There is always time for cuddles. Image via iStock. 9. You will step back more. It’s easier to let them try it for themselves when you know from experience its achievable. 10. Unfortunately you probably won’t stress less, but you will stress about different things. You’ve worried about not-enough sleep and too much milk. You’ve worried about strange coughs and weird coloured poos. The next few times around your worries will change. Will you love this one as much? Yes. Will your older sibling cope? Yes. Will you ever have time for yourself again? Yes. One day. Will your partner ever do the laundry? Haven&apos;t yet worked out the answer to that. If you have two or more kids what changed for you?